Continue reading"A new IoT malware loader: «privatgodgg.sh»"
Continue reading"Google Dork Hacking: «use our awesome search tool…»"
Gr1N — a new malware that also targets IoT devices? Continue reading"Gr1N — a new malware that also targets IoT devices?" Google Analytics — no data validation? 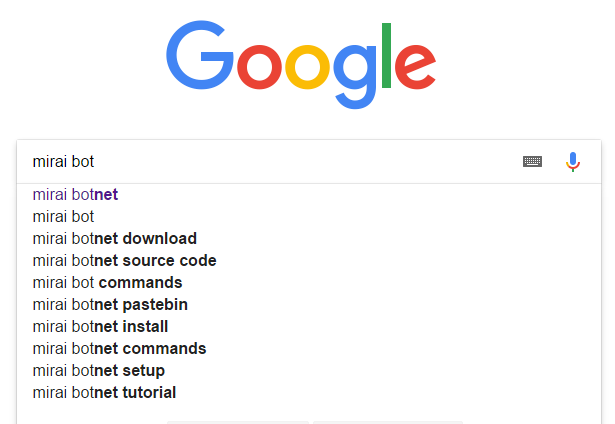 Google Search suggestions show an increase interest and, maybe, demand in Mirai — the piece of software used to create botnets capable of [very large] DDoS attacks. Brace yourself for new strains and attacks. P.S. The part with «mirai botnet tutorial» is kind of funny. Kind of.